I tried and implemented the formulas from the above resources to indirectly calculate MAF and then ultimately get fuel flow rate but the final result is too unrealistic, for instance i was getting 2.6 gallons/sec of fuel flow rate. Now i know it is possible to somehow calculate fuel flow rate indirectly because another app namely "Torque" could calculate fuel flow rate on the same car under the very same conditions and gave something like 0.000066 gallons/sec, which seems believable. I tried to contact the torque application developer but was unlucky. There was a variable called volumetric efficiency used in the formulas above which i just assumed for my car to have 70%. Please i need help i need to know what am i doing wrong or is there some other formula that can be used. The engine displacement was in CC so i divided it by 1000 to convert to litres and the temperature was in deg celsius so i added 273 to convert it to deg kelvin.These were the formula requirements.Where i am guessing the volumetric efficiency to be 80%. Now i don't need to be accurate here, i just need the fuel flow calculation to be atleast believable. No accuracy required at all. 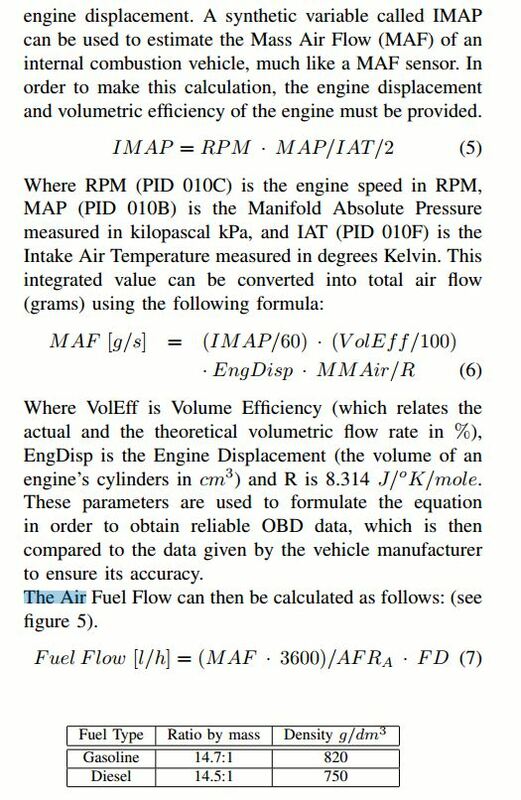 probably results in a close estimation of MAF that is highly dependent on the accuracy of VE(Volumetric efficiency).I assumed it to be 80%.If there is some kind of way to calculate VE based of obd parameters not using mass air flow itself, then it would be great. Otherwise you just have to assume on VE percentage. Not the answer you're looking for? Browse other questions tagged fuel-system obd-ii fuel-consumption air-intake fuel-injectors or ask your own question. How to calculate accurate fuel consumption for Diesel engine by using OBD data? How read/calculate the amount of consumed fuel estimated for a travel?